G7 Entertainment Marketing approached Kru Live with a challenge: sourcing ambassadors to go on tour with U2 across all European tour dates to represent Salesforce and educate fans on the awareness of both the Salesforce foundation and the RED Foundation. Kru Live selected 96 enthusiastic and outgoing brand ambassadors to engage with fans in Italy, Holland, Sweden, Germany, Spain, Belgium, France and the UK; and encourage them to take part in the activation before the beginning of the show. 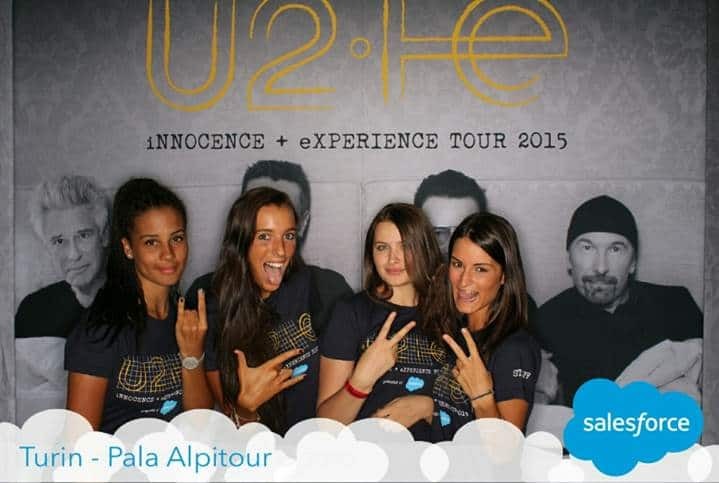 Our brand ambassadors greeted the fans on arrival and educated them on how they could get involved in supporting both charities; they encouraged them to take a photo with the U2 Salesforce background and to spread the word on their social media accounts with the hashtag #poweredbysalesforce, specially set for the occasion. The activation aimed to increase both donations and awareness of the two non-profit organisations.